Vacation Rental by Owner. 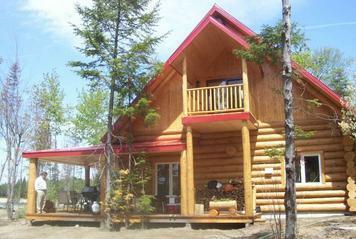 Holiday Villa in Ste-Christine D'Auvergne, Quebec, Canada. Late Deals, Special Offers. Log home and cottage rentals in front of water. Vacation rental. A rendez-vous for nature lovers at 50 minutes from Quebec city. Summer and winter alike, the great outdoors is an endless source of pleasure, a restful haven of tranquillity that's yours to enjoy amidst the beautiful natural surroundings of our little corner of paradise. More than 26 cottages now! Located on a huge tract of land in the heart of beautiful Portneuf, the cottages provide access to a vast network of forest trails and miles of river. Portneuf is a favorite vacation spot, with fine country dining and countless tourist attractions - a must for visitors all year round. More than 26 cottages now!